For Kaiser Permanente, the largest non-profit health plan in the US, putting patients at the very center of the enterprise is everything. Last year, Kaiser began opening 10 new “health hubs” in Southern California, designed to give a complete overhaul of the patient experience, where everything from the check-in process to the aesthetics of the waiting room have been reimagined to put patient care at the very core of every visit. Nowhere is this better exemplified than in the exam room. The centerpiece is a spacious leather chair slap bang in the middle of the room, where everything quite literally revolves around the patient. These chairs are indeed a far-cry from the standard, paper-covered tables – upon which patients are required to perch awkwardly and even embarrassedly during examination – that have been the mainstay of hospitals historically. But at Kaiser health hubs, patients can now sit eye-to-eye with their physician, who can use a wall-mounted touchscreen to summon lab results, X-rays, and video consultations with specialists. The docs can even send prescriptions to the on-site pharmacies using a tablet. Kaiser, of course, has a strong history of innovation – and technological innovation, of which the touchscreens and tablets are the latest example, at that. In 2010, it invested $4 billion to become among the first big health systems to successfully implement electronic medical records. Two years later it launched its mobile app, enabling patients to access their records on-the-go and around-the-clock, as well as book appointments and order prescription refills. Today, Kaiser doctors conduct more than 20 million telehealth appointments every year, often via video consults. 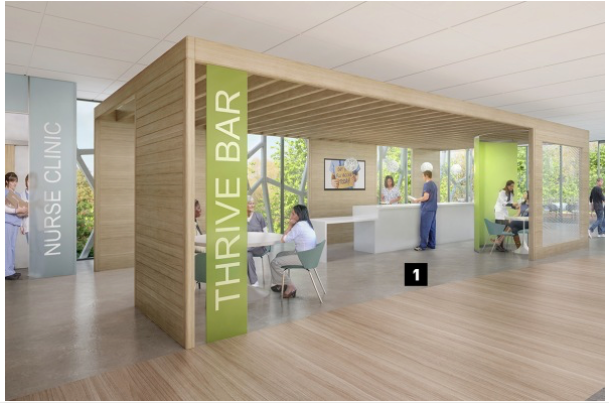 But the new health hubs represent Kaiser’s vision for the future of health care delivery – a future where a design-driven approach to medicine that puts patient experiences at the very center of all activities will become the new normal of health care. Tyson considers the hubs as pilots – real-world testing laboratories where new innovations, designs, and work flow initiatives can be fine-tuned before roll-out to more Kaiser clinics across the country. It begins in the reception area. Taking their cue from the realms of retail or hotel hospitality, patients and visitors can check-in via electronic kiosks, or otherwise wait to speak to a receptionist readily armed with a tablet. Taking a load off on lounge-like seating while plenty of natural light beams in to bathe a living wall of green plants, patients await a text message to let them know that their physician is ready to see them. In the meantime, patients can make use of the vitals station to measure their heart rate and blood pressure, or visit the “Thrive Bar” – inspired by Apple’s Genius Bar – where experts are on hand to give free advice on exercise, nutrition, and other wellness issues. In some of the larger health hubs, the reception areas are designed to take the form almost of a public square, around which patients are able to walk and even take part in yoga classes, cooking demonstrations, and other programs offered both indoors and outdoors. The emphasis is clearly on providing education and preventive care in Kaiser health hubs. But the new spaces are also about keeping costs low and improving efficiency. 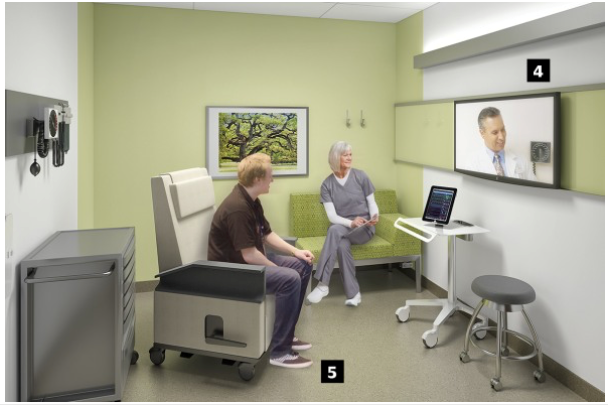 The hubs are projected to boost the number of face-to-face visits per exam room by between 20% and 40%, and the space-conscious floor plans will deliver overall square-footage cost savings of around 10%, aided in part by better-designed collaborative work flows and investments in new technologies. The largest hub in Los Angeles is more than 100,000 square feet, and includes a two-mile walking path, conference and event spaces, and a thriving garden. But, just as important for Kaiser is how the hubs will be used as physical anchor-points for a new model of health care that aims to move as many services as possible out of hospitals and clinics and into its members’ communities and homes. This will involve investing more in telehealth and other virtual services, though work is currently underway on an initiative called Pivot, which will provide community-based services to address issues such as smoking, drinking and weight-loss. In addition, Kaiser has also announced that it will be opening its own medical school in Pasadena, California, in 2019 – a complex designed to train doctors in its unique model of health care delivery. Hear Kaiser Permanente’s Brent Bowman, Vice President, Strategy & Patient Experience, at Next Generation Patient Experience 2017 this November.